(Nanowerk News) The Global Green Growth Institute (GGGI) and the United Nations Industrial Development Organization (UNIDO) released a report demonstrating that increases in clean energy investments create more job opportunities. The report, presented at the Vienna Energy Forum 2015, states that of the world’s 45,000 million metric tons of greenhouse gases (GHG) emitted in 2010, about 82 per cent were generated by energy-based sources. 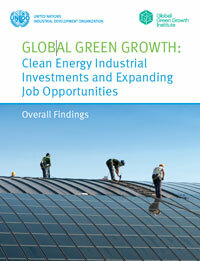 “Global Green Growth: Clean Energy Industrial Investment and Expanding Job Opportunities” provides evidence that there are clear net-gains in employment generation by making investments in the clean energy industry rather than in the conventional, GHG emitting fossil fuel industry. “Significant progress has already been made in overcoming the hitherto conventional wisdom that taking steps to cut GHGs is incompatible with economic growth," said Yvo de Boer, Director-General of GGGI. "This report moves the debate another positive step forward by showing that employment and development result from sustainable, green growth." The report indicates that countries which sustain annual investments in energy efficiency and clean renewables at a rate of 1.5 per cent of GDP will be able to maintain healthy economic growth rates, while providing sufficient energy resources to sustain growth. The employment impacts of large-scale clean energy plans in five countries – Brazil, Germany, Indonesia, South Africa, and the Republic of Korea – are assessed in the report, which examines the policy frameworks being implemented to meet GHG reduction targets without inhibiting employment and other economic opportunities. The report consists of two volumes that present the overall findings of the study and the respective policy frameworks of each country. “Today’s publication demonstrates the importance of stakeholder cooperation as well as forward-looking industrial policies and what they can achieve in the effort to find practical and innovative solutions to the global community’s sustainable development challenges,” said Myung-Kyoon Lee, Director of GGGI’s Knowledge Services Department. Over 1,000 participants are attending this year’s Vienna Energy Forum, which is organized by UNIDO and serves as a high-level platform for multi-stakeholder dialogue on pivotal sustainable energy issues. Download full reports: Global Green Growth Report Volume 1 and Volume 2 (pdf).